If you follow me on Instagram you’ll probably notice I haven’t posted many images of our homes exterior, because, until recently, it was the part we left until the end (along with our kitchen garden which you can see here). 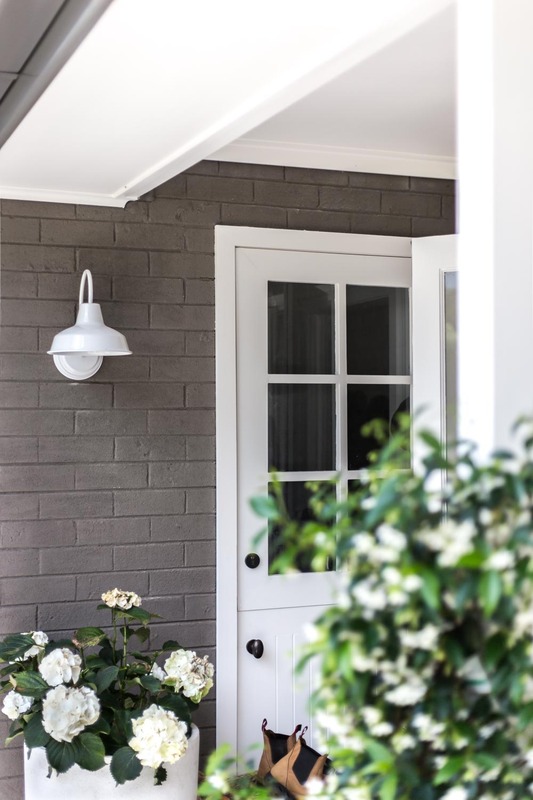 Even small things like painting our avocado green eaves and brown gutters became a non-priority – as much as I disdained them! I’m working on a full ‘Before and After’ post for next month, but before I do I thought I’d share a few snippets of our exterior, especially because we finally installed our new exterior barn lights! 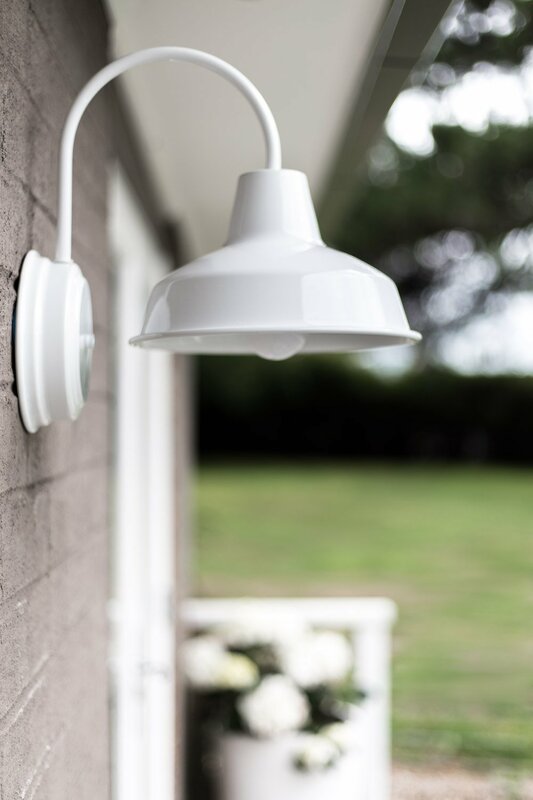 I reached out to Barn Light Australia when I was looking for some new exterior wall lights, as the previous ones we had installed (that we brought back from Home Depot in the US after a trip to Hawaii) were a bit too cheap for my liking. They were really cute, but they just didn’t quite look right with our house and the quality just wasn’t there either. So, I needed to find something else that would contrast against the house a bit more, that were also a higher quality fitting. I’ve loved Barn Light Australia’s lights for years and often recommended them to clients or friends, but had never used them myself before. 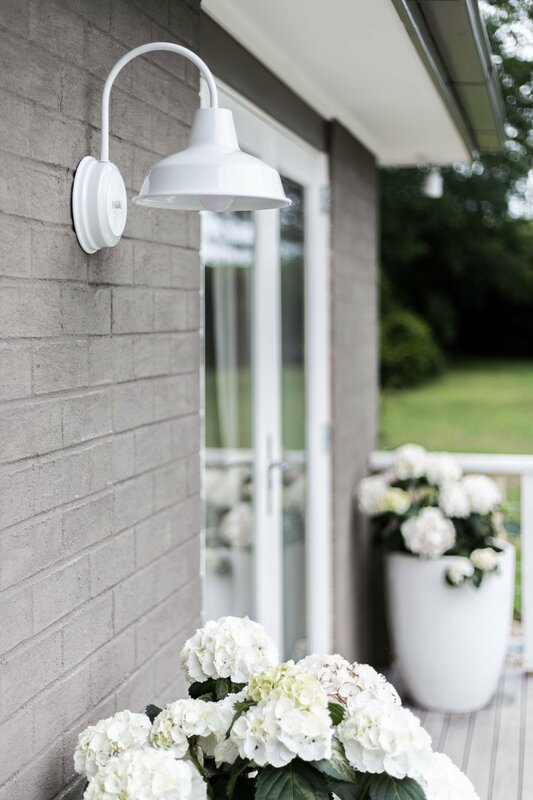 I chose the Austin Wall Sconce, as it was a clean and simple looking fitting, but also very much that farmhouse / barn style look we were going for. I also love the fact that they can be custom powder coated in so many different colours. 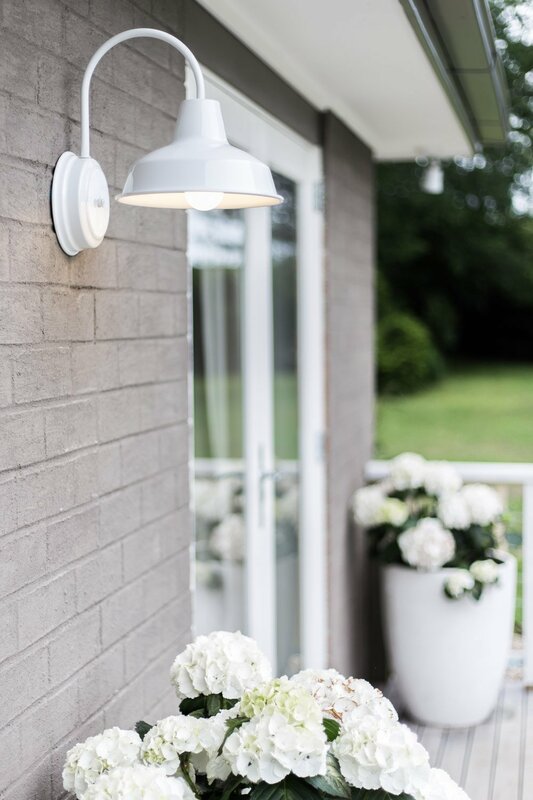 We went for white as we wanted the lights to really pop against our dark, bagged brick exterior (more on that in the Before & After post next month! ), but also to tie in with all our white trim. These lights are such nice quality and the perfect size as well. Once installed we really couldn’t quite believe the difference they made and how much better the house looked! Barn Light Australia were also so fantastic to deal with too. 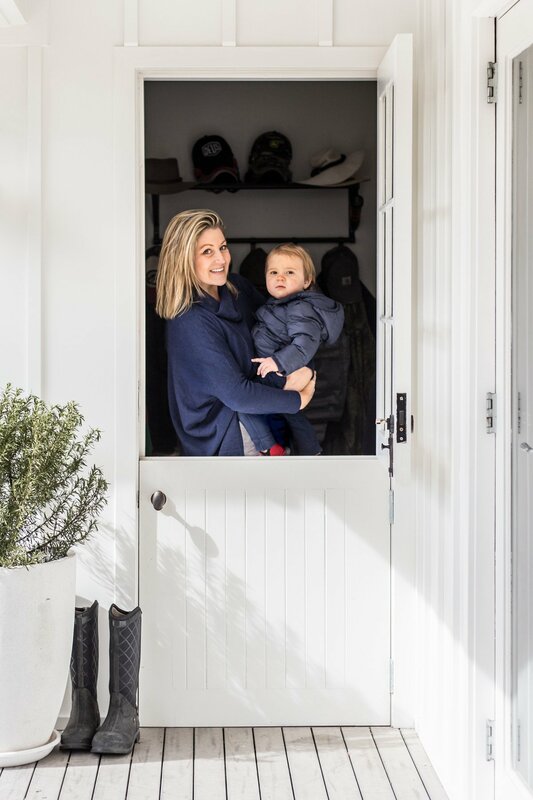 Top customer service, very friendly and efficient, which I really appreciate as I often have a million things on the go between work, our home renovation and juggling motherhood and family demands! To view more of their beautiful products, you can visit their website here. Feel free to ask any questions about our lighting too! Hi Louise! Thank you so much for your truly lovely comment! That means so much and so thrilled that you love the barn lights as well! They’re one of my favourite things we’ve installed in our whole renovation! 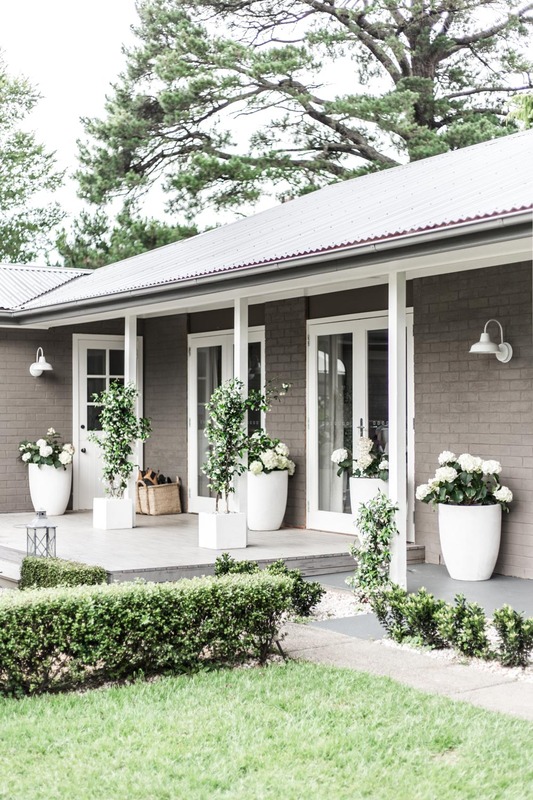 I am so interested to learn about the color and texture you used on your exterior brick! Please update soon! I absolutely love the exterior also its such a nice colour can i ask what the colour is, or would be close to? And would love to see what it looks like outside now!!! Your hosue looks gorGeous! We have a terrible brown brick house and wondering what to do with and it when yours came up on pinterest.. are you able to tell us what you dod pretty please? Love the colour, texture and everything! Hi Lauren, do you take your own photograpHs? So much air aNd natural light, they (and youR home) are gorgeous! Any tips for home photography? i wanted to reach out about the coloring of your home? 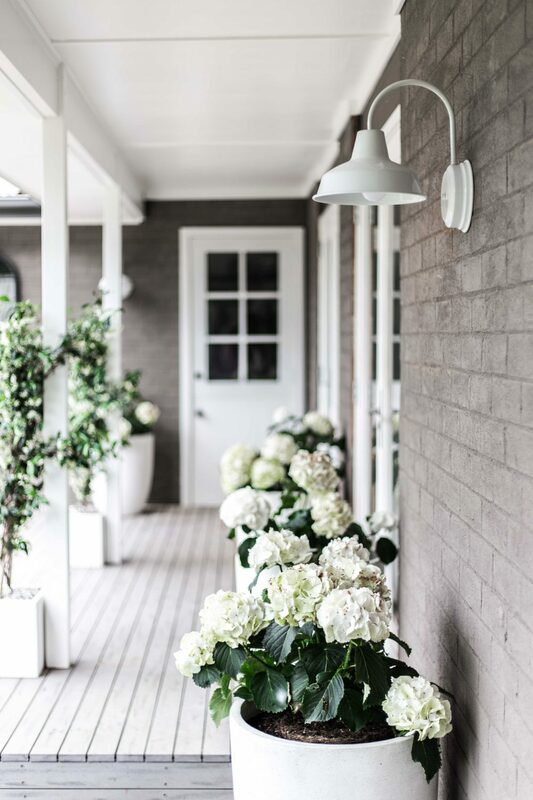 my husband and I just purchased a split level home and I am thinking this color on the siding would be perfect with a darker multi brownish colored brick with white trim. would love your advise and expertise. Your barn lights Are gorgeous, but what really caught my eye in the first photo was the beautiful dutch door. Could you share the details of where you got it?